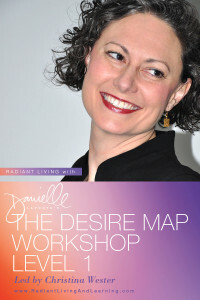 A 2 day course for discovering your core desired feelings … and lighting up your life! 2 full days of time and space dedicated solely to LOVING YOURSELF and investing in your RADIANT LIFE! Lunch and snacks both days. $111 Reserves your seat now! Please fill out the form below and send your paypal payment to christinawester@mac.com. Contact Us if you need to make other payment arrangements. I’m looking forward to spending this transformative weekend with you!